Golden Isles in Hallandale Florida is a gated deep waterfront single family home community with ocean access and no fixed bridges. There are approximately 304 properties within the gates of this Broward County community with 99% of the properties on the water and only 5 homes on dry lots. A few great notable points of Golden Isles are: it’s a protected waterfront community (protection for your vessel during storms and high winds), all of the canals are wide and deep enough for about any vessel that can be moored on any of its lots, ocean access is just 15 minutes away to the south at The Haulover Inlet and 45 minutes to Port Everglades Inlet to the north. 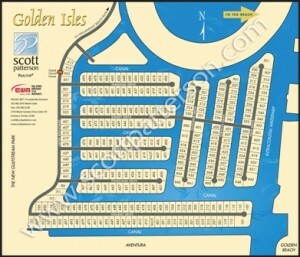 Golden Isles is right on the Broward/Miami-Dade County line and right across from Golden Beach Florida. As home prices in Golden Beach soar, Golden Isles has become more attractive although it might not be as exclusive or have the name recognition of Golden Beach. As a boat owner, one of the advantages of Golden Isles is that like I said it’s on deep water allowing for larger boats unlike Golden Beach which has numerous of its waterfront properties sitting on very shallow water and does not allow for boats that draw as little as 4 feet. In my opinion, Golden Isles is one of South Florida’s premier deep waterfront communities whether you just want to live on the water, are a boat owner or both. Golden Isles is minutes from Aventura, Bal Harbour and the Hollywood-Fort Lauderdale International Airport, right in the center of both Market’s of Miami-Dade & Fort Lauderdale. I Recently just sold Villa 4 at the famous historic Miami Beach Bath Club for 6.7 million on April 28th, 2008 to a couple from Pennsylvania. There are only six villas at the Bath Club and they are the only oceanfront residences on Miami Beach. The Bath Club of Miami Beach first opened its doors in 1926, it was the place to be and be seen. The Bath Club was redeveloped by Don Peebles and offers direct oceanfront living. The Bath Club is blending the old with the new, with six single family oceanfront villas, 107 exclusive condo units and offers all the amenities of a five-star hotel located minutes from the heart of Miami Beach. Here is one of the aerials I took of Golden Beach while photographing different market areas and listings via helicopter. Golden Beach Florida sits on 1.8 miles along the northern most portion of Ocean Blvd (State Road A1A) at the Miami-Dade/ Broward County line in South Florida. This exclusive town is bordered by the Atlantic Ocean to the East, the Intracoastal Waterway to the West, and the coastal cities/communities of Hallandale Beach (Golden Isles) to the North and Sunny Isles Beach to the South. Also, Golden Beach is situated between both Miami (Miami Beach) and Ft. Lauderdale and minutes to The Shoppes of Bal Harbour. 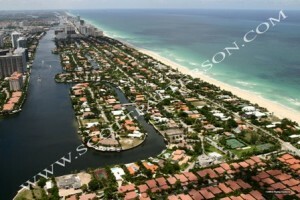 Golden Beach Florida was incorporated in 1929 and has become one of the most desirable places to live in South Florida. One of the most recent purchases was Ricky Martin, who purchased 641 Ocean Blvd for $17,500,000… This small quiet community has maintained its family lifestyle in a mile-long sanctuary of 370 single-family homes that are mostly located on the Intracoastal and its waterways or directly on the Atlantic Ocean. The Town Charter protects Golden Beach from commercial activity of any kind and forbids the construction of high rise condominiums that saturate so many beach front communities in South Florida. A beautiful mile and one-eighth of private beach with a historic beach Pavilion, 3 parks, and a committed sense of community have attracted talented, discerning residents from all over the world to this idyllic town located only 18 miles from Miami International Airport and 15 miles from Ft. Lauderdale International and Port Everglades. Golden Beach provides security through its own Police Department. The Building and Zoning Department, Finance and Administrative Department, and the Public Works Department provide other services. Golden Beach Florida is a beautiful and unique place to live!